Yes! Even when it comes to DIY home maintenance works, many of today’s women can achieve anything they put their minds to, as long as it doesn’t involve hauling heavy tools or materials around the home for repair purposes. Women have been known to carry out kitchens and bathroom remodelling works, including repairing furniture, attending to plumbing problems, house painting, fixing ironmongery, and even installing a new doorbell. If you are a single independent woman, a single mother, or a woman living alone, this is a call to unfold more of yourself as you may have hidden qualities that you never knew you possessed You may have latent qualities of a great household maintenance person including being good at home improvement works around your home. And for women in general, trying your hands out on home repair tasks is an area where you can discover yourself. Plus many more. And if you are really stuck and don’t know how to go about a certain task, then do some research on the internet, in places like YouTube. The web is today's library and contains up-to-the-minute advice on best home improvement ideas, tutorials, and tips, plus information on how to accomplish ANY task around the home. 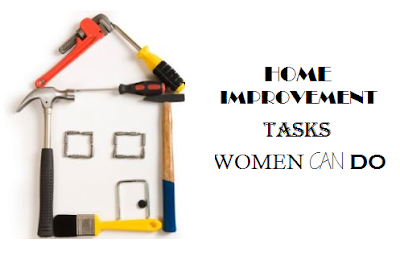 Have you seen the wonderful tool-kits for home improvement tasks designed strictly for women? There is really no difference in the tool content except that they come in lovely feminine colours. Additionally, you can get a beautiful easy to carry tool organiser (toolbox) or similar container to keep all your home improvement tools in. Also, you can easily make (or buy) a workman's "apron" with functional pockets to hold smaller tools in a convenient place whilst doing your maintenance tasks around the home. Functionality is the most important benefit of any tool, so it is good to ensure you purchase the right kinds of tool-kits and power tools. In the event that you need a particular tool but don’t have it, get creative and use what you have to get what you want. For instance, if you need to replace the garbage disposal unit of your kitchen sink, though it may seem a bit of a challenge to hold it under the sink and tighten it down from the top at the same time, you can get ingenious by using the jack from your car to jack the disposal in place while working on it from above. Voila! If you absolutely must, get help, rather than mess things up further, especially for more complicated tasks. 'Habitat for Humanity' - You can volunteer to take part in projects within your locality. You will be with other volunteers who are also learning how to acquire homebuilding and maintenance skills. In your home, you will use such skills constructively. BeJane - This is a great site that teaches women how to do home projects. They have experts and awesome tips and you will learn a lot about home improvement and general household repairs from them. Talented handymen on HGTV - There are TV shows about the best home improvement tips, new ideas and effective methods used. You can learn as much as is possible from watching professional designers re-do homes and carry out home improvement tasks. They always have the best home improvement ideas for making any DIY repairs or decorating jobs around the home easier. Alternatively, get a go-to-book on home improvement tasks. Keep such books in an area of the home where you will quickly find and easily refer to if the need for some home repair works suddenly arises. Some local DIY centres or Home Depot stores hold the best home improvement 'how-to-do-it-yourself' classes, and they have detailed tutorials that will guide you through every step. You can also have online chats with home improvement department staff online. They are always helpful and will clearly explain what you need to know and do. Not only that, you will be advised on what tools and other things you’ll need to purchase to get your repair jobs around the home done. It takes willingness, perseverance and bit of courage to begin. If you need to learn about home maintenance works you can do yourself, persevere through all the learning steps. This way will certainly enjoy your DIY handiwork.